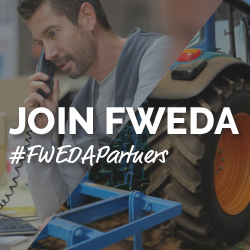 Farmers and ranchers constantly wrestle with the question of whether to acquire new equipment. To be competitive and successful in American business where efficiency is prized, it usually takes a willingness to change and adopt new ways. Evolutionary biologists call this the “Red Queen Hypothesis,” named for the character in Through the Looking-Glass. When applied to agriculture, the idea reflects the challenge of adopting new inventions. Do U.S. farmers run twice as fast, buying new equipment, but risking bankruptcy, or should they stand still and go with tradition? Cotton farming is a prime example of the effects of mechanization. Traditionally grown, the crop is extremely labor-intensive; however, many breakthrough inventions have enabled American success. The wire-tooth gin, patented by Eli Whitney in 1794, made it economically possible to process the more easily grown short staple upland cotton. Instead of squeezing the smooth seed from the cotton using a traditional roller gin (as was done with sea isle cotton), Whitney’s invention ripped the lint from the fuzzy seeds of the upland variety. With the aid of Whitney’s gin, farmers switched to improved cultivars and vast new cotton lands opened up. Cotton was the nation’s leading export crop from 1803 to 1937. While producers adopted mechanized ginning early, growing and harvesting remained labor intensive. Cotton growers first depended on slave labor and then share cropping and migrant workers, to tend their crops. 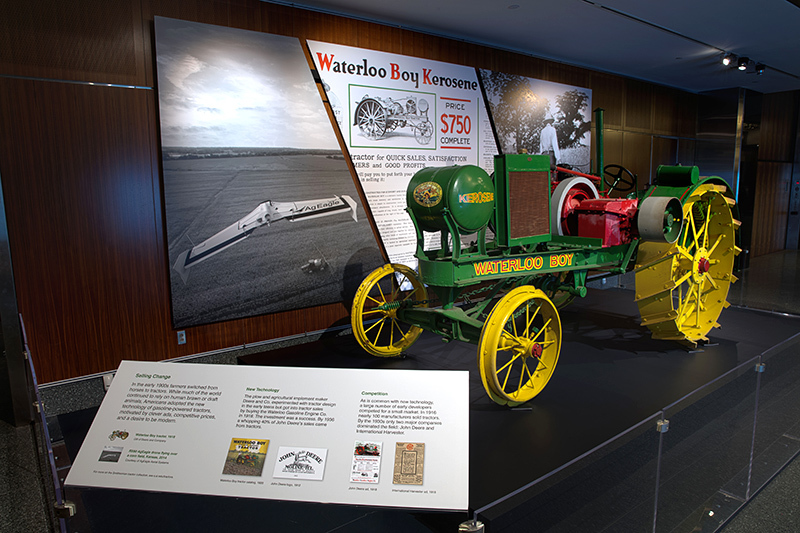 The adoption of lightweight, mass produced tractors began to change farming practice in the teens and twenties. In his famous book, Grapes of Wrath, novelist John Steinbeck noted the rising use of tractors in cotton farming. Chapter 5 opens with a description of a tractor brushing the Joad’s house, knocking it from its foundation. Steinbeck’s descriptive metaphor, while fictional, illustrates how in real life the use of tractors made it possible to push sharecroppers aside. 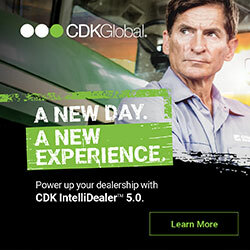 A single operator could plow, seed, and cultivate more acres with the new machines. Some critics worried about the social effects of displacing tenant farmers – being ‘tractored out.’ Others celebrated the application of modern machinery and increased efficiency to agriculture. The use of tractors in cotton caught on in the 1920s but harvesting remained a challenge. Many inventors experimented with different ideas from mechanical fingers to vacuums but an effective cotton harvester remained elusive. Since cotton does not ripen all at once, fields are picked several times and a successful mechanical harvester cannot damage the plants. After much experimentation, International Harvester produced an effective spindle based cotton picker in the 1940s. To demonstrate the technology in the important California market, International Harvester sold Producer’s Cotton Oil Co of Fresno California a pre-production model H-10-H single-row cotton picker in 1943. For sixteen years, the harvester lumbered through the Californian fields harvesting about 8,000 bales of cotton. 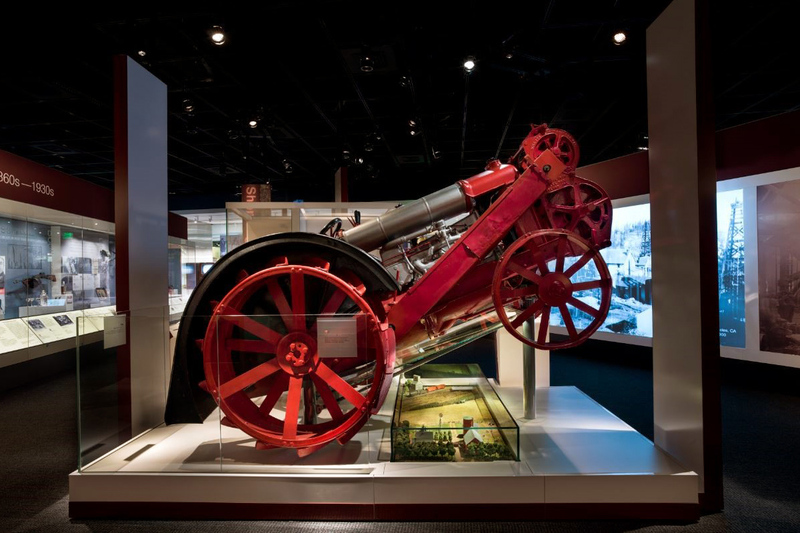 After its retirement in 1959, and realizing the importance of the machine, the company restored and donated this first commercially successful cotton harvester to the Smithsonian in the 1970s. 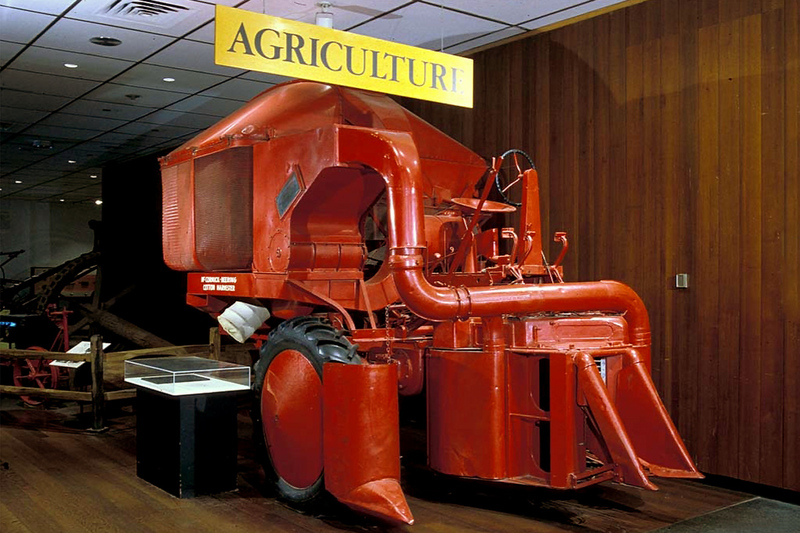 Lovingly know as Old Red, the ASABE identified the picker as an agricultural engineering landmark in 1978 and it remained on exhibition for many years. As great as this story might be it turns out Old Red is more than just the first successful commercial cotton picker. Hidden in the bowels of the harvester is a complete Farmall H tractor. The cotton harvester was in fact merely a mammoth attachment that completely engulfed a standard row crop tractor. Of course some modification was needed. 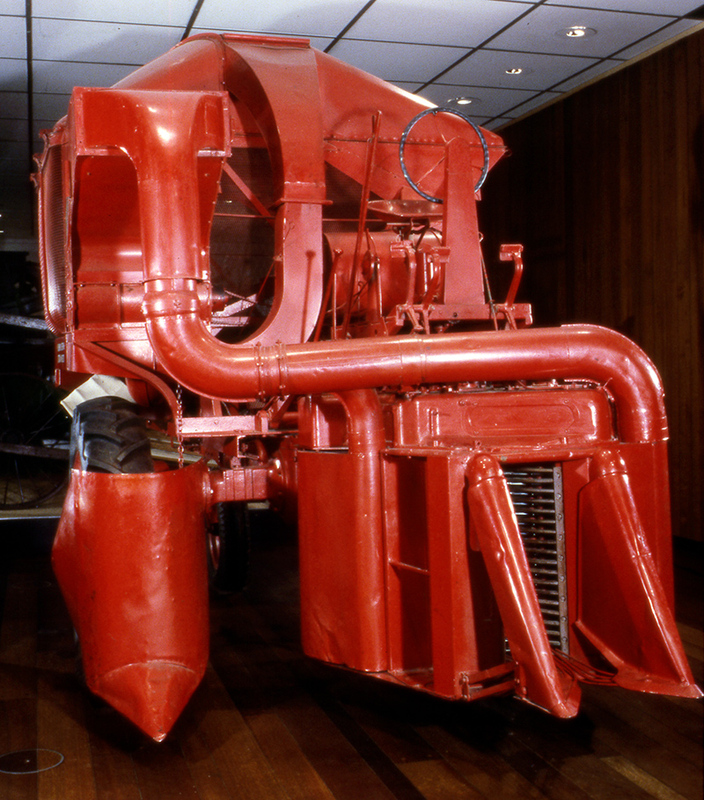 In order to prevent the machine from crushing the cotton plants the operator had to drive the tractor backwards requiring the transmission, steering, and seat to be reversed. 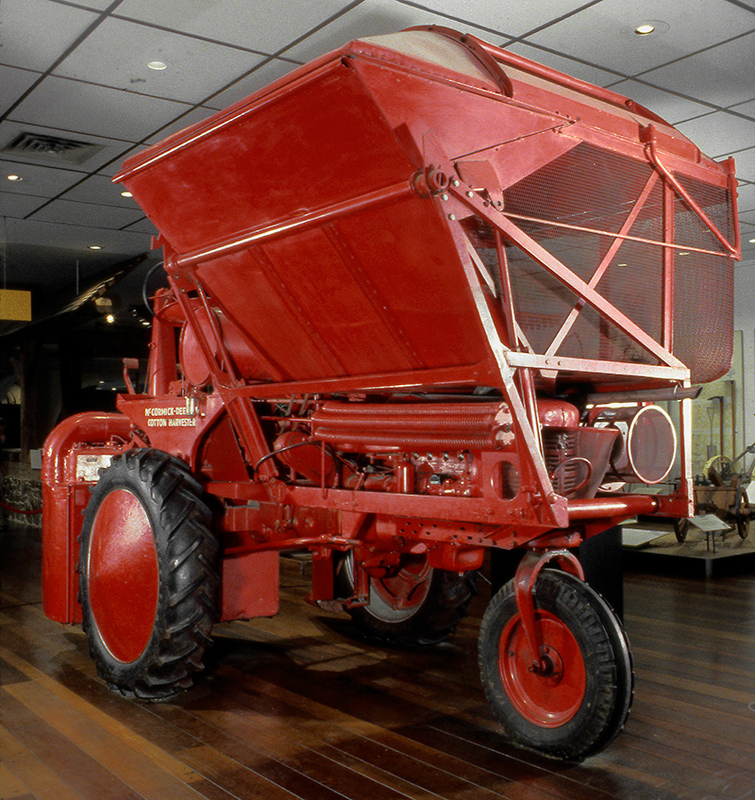 One of the first general purpose row crop tractors, the Farmall H was in production from 1939 until 1953. The tricycle set-up made the tractor more maneuverable than four wheeled tractors and its power take off (PTO) and powered equipment lift made it immensely popular for medium sized farms. Gone were the steel lugged wheels of the 1920s, the Farmall H sported pneumatic rubber tires which reduced vibration and fuel consumption. From a curator’s perspective, Old Red is a fabulous artifact. It represents the rise of cotton production in the far west and it documents the transition from hand-picked to machine harvested cotton. The fact that it contains one of the first row crop tractors is an unexpected bonus. Three stories in the space of one! Throughout Peter Liebhold’s professional life he has been involved with industrial history and the effort to preserve the working history of the nation. Since 1985 he has curated and co-curated numerous exhibitions at the Smithsonian. 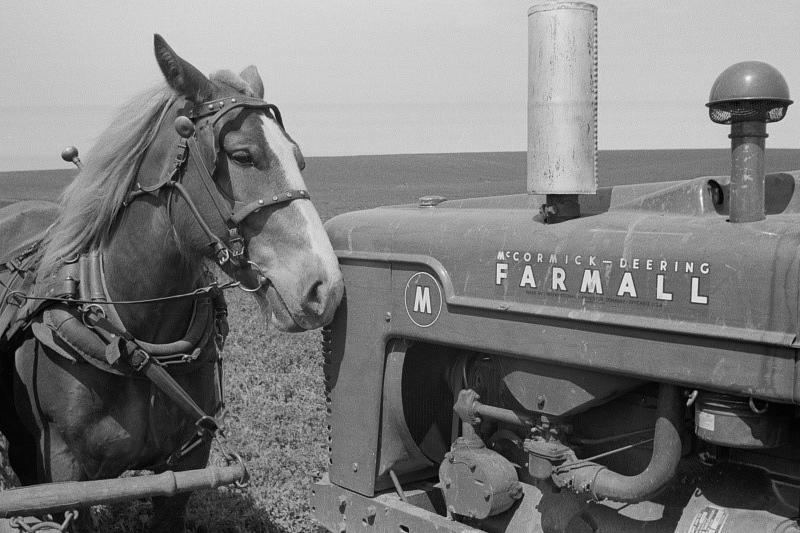 C. Belmont Faries, “”’Tractored Out’ of Farms: Migratory Agricultural Workers Present New Problem,” The Sunday Star, Washington, DC, February 26, 1939.